Many of the people have common thinking that a gas powered pressure washer is not good compared to its counterpart. They think it’s easier to handle an electric machine and they are cheap as well. But only the experts understand its real value. Another reason for not liking the gas-powered engine is that they don’t buy good quality machine and fall in trouble aftermath. If you plan to buy a gas pressure washer here is one of the good options for you. Excell EPW1792500 is a wonderful machine that generates a considerably good PSI which is perfect for residential use. This product makes cleaning work easy, comfortable and fast. In the present world, we all are quite busy with our regular works. In this condition, we cannot spend much time cleaning our stuffs. You can easily use this pressure washer to clean many of your stuffs such as the car, RV, house, fencing, patio, rooftop, balcony, house outings, etc. The machine is specially designed for using home uses. To beat the finest dirt you need a powerful machine that can easily remove your dirt. Powerful machine means having a powerful engine that generates high water pressure. This machine has 179cc engine which is capable of creating 2500 PSI. It provides 2.5 GPM water flow to match with this pressurized water. This combination is perfectly made so that while cleaning no trouble is made. This product contains 25’ x ¼” durable high-pressure hose that is kink resistant. You can comfortably use it without taking much care. It also has 5 quick connect nozzle containing 0, 15, 25, 40 and 60-degrees so that you get your desired pressure while cleaning your areas. Its spray gun is comfortable to hold which is important in work. Comfortable apparatus is easier to use. You might worry about its weight because gas pressure washers are a little heavier than its counterparts. In terms of this machine also you might have to face this problem but we can assure that it is not heavier than the machines of its class. Its total weight is 77 lbs and dimension is 23.23 x 17.32 x 24.41 inches. Maneuverability is a big question when a heavy machine is a topic. This product has two 10 inches wheel that carries the entire body and to carry it has a comfortable handle. You can easily move your product wherever you like. Strong metal is used to give this machine a tough and durable condition. Strength: Gas powered machine means increased power that cleans tough dirt easily. This machine also is no exception. It provides you strength and durability at the same time. To clean your oil and grease stains it will serve you well. You can even remove your old paint easily; cleaning house outings will be comfortable. Perfect Storage: To keep all its apparatus tidy this machine has a very convenient and proper onboard storage. You will see that there is storage for hose, storage for its spray gun. You can easily keep all the nozzles serially so that you find them easily. Durability: The machine is quite durable and has the capability to serve you without giving much trouble. We need to think about our investment as it’s our hard earned money. No one wants to waste it. Your investment will be safe and fruitful with this product. Maneuverability: Moving a machine is a big barrier when it comes to work a little away from home. This product is perfectly maneuverable with its two wheels. You can easily put it in your car or truck and take it to your cleaning area. High Pressure: Water pressure is the main thing to clean dirt with a pressure washer. If you don’t get enough pressure your work will be either delayed or it will be a total mess. This machine provides a perfect combination of water pressure and water flow. Your work will be smooth and effective. According to a user, the engine bogs more when its trigger is released. A user said that its pump failed after a few months of buying. These can be considered as technical problems that we always find in some machines. To sum up we can say that apart from its few technical faults this machine is perfect to clean your hard-to-clean dirt. It is specially manufactured for residential use and you can use it in your office as well. Your hard earned money will be in proper use with this product. 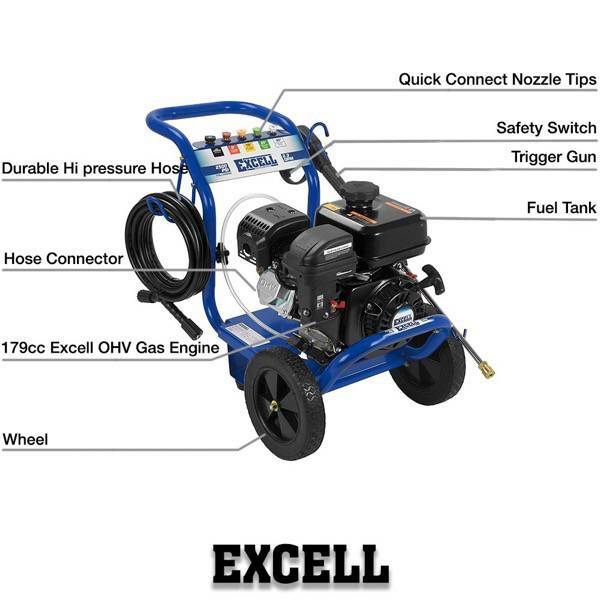 In the pressure washer world, Excell has a good name for making good quality products. Along with other famous brands people depend on their products easily. Now, it’s up to you to decide whether this pressure washer is proper for you.